One year ago I published a short article about a rather unusual prosecution by the Health and Care Professions Council (HCPC) where they brought criminal proceedings against me for calling myself a podiatrist. You will be surprised to hear that the case is still active and has developed into quite an extraordinary legal and regulatory debacle with far reaching consequences for many who have been involved. When the case concludes later this year, it will present Government with some challenging and important issues for future health regulation. I have attached a paper I published last June that details the background and first prosecution in which I initially pled guilty and was convicted, before overturning the conviction at appeal. When I wrote this article last summer, I was waiting to hear if the HCPC would table a second prosecution or abandon the case. Subsequently, they proceeded with a second prosecution, which commenced in September last year. It may be helpful if I summarise matters again. You will recall I ceased my registration with the HCPC in September 2008 when the Registrar, Mr Marc Seale, declined to answer correspondence that highlighted a serious flaw in their legislation that permitted clinicians who have been struck-off for serious offences, to continue in practice in the private sector without any restriction or regulatory scrutiny. At the time, I thought I was committing an offence as I still practised as a podiatrist after deregistering – and I had hoped that this might provoke the Registrar into responding. The HCPC wrote to me formally and told me that if I were to call myself a podiatrist without being registered with them, that I would be liable to prosecution. But the Registrar still did not respond and regrettably I felt compelled to maintain my protest. Between 2008 and 2013, nothing happened other than occasionally I would receive a “cease and desist” letter from the regulator informing me that they were aware I was using a “protected title” and as I was not registered with them then I may be liable to prosecution. Each time I received a letter, I would reply stating I would be happy to register once again providing my concerns on public safety were addressed in a letter from the Registrar. This never materialised. During this period I practised in a small complimentary clinic in St Annes, which was owned by an osteopath. I rented a room at the clinic in 2006 and worked there until March 2012. Unfortunately, what was a delightful work environment with some exceptional people., deteriorated into an altogether unpleasant experience in 2011 when the owner of the clinic encountered serious financial problems, which eventually led to a breakdown in relationships, both personally and professionally, with most staff leaving by the end of the year. I left in March when I discovered that several hundred pounds had been taken from one of my accounts in cash without my knowledge. We did not part on good terms. One year later, in March 2013, I received a summons from the HCPC for a prosecution of an offence under Article 39 of the Health Professions Order for “Misuse of Title”. With the Summons was an evidence bundle, which contained two complaints the HCPC had received the previous year from the wife of the osteopath and one of his friends. The complaints alleged that I had deceived the osteopath regarding my registration status by not informing him of my decision to deregister. Accompanying the complaint from his wife were several receipts and invoices purportedly taken from my patient files to demonstrate that I had kept on using the prefix “HCPC Registered” and included my old registration number after I had ceased registration. These allegations were wholly untrue and the documents in the evidence bundle were copies of computerised patient records retained by the osteopath on his clinic computer and fraudulently altered. It was straightforward to counter these allegations and documents; I have retained my patient records and obtained the original paperwork that clearly demonstrates the documents were altered. I also had detailed witness statements from all the secretarial staff who worked at the clinic at the time which confirmed the documents were false – and that the osteopath was fully cognisant of my decision to cease registration and was actively supportive of my decision to do so. This spiteful and mischievous act from an individual with a grudge was to have more serious consequences than I could ever imagine at the time. These complaints gave the HCPC what they believed to be sufficient evidence of “an intent to deceive”. This is indeed part of the offence I was to be prosecuted for, however its importance, as an essential ingredient of the offence, was not something I was aware of at the time – and with good reason. Since the HCPC came into being in 2003, it has maintained the position that it is an offence to use a protected title – such as chiropodist or podiatrist – unless registration is held concurrently. It is a position that was accepted by the professional bodies – and the profession generally. It didn’t stop the problem of unregulated practitioners – they simply circumvented the spirit of the legislation and adopted a different name – Foot Health Practitioners. But we all accepted that the primary titles were protected and thus there was, at least, some public safeguarding – in the NHS if not the private sector. Thus, when I ceased registration and told the HCPC I was keeping my “title” – I thought I was committing an offence. But I was wrong. I was wrong because I believed what the HCPC had told me. That it was an offence to use a title without being registered with them. It is not. During the Old Bailey appeal to my first prosecution, the HCPC barrister made an extraordinary admission to the Judge, HJH Pontius, when she agreed that use of the title without registration is not an offence on its own. There must also be evidence of dishonesty – of “an intent to deceive, either expressly or by implication”. A person can legally use a title without holding registration with the HCPC as long as there is no accompanying deception. They cannot state or imply they are registered when they are not. That is the offence. This was a remarkable admission given what had gone before. When I ceased registration I undertook to remove all reference to my previous registration details and to inform all patients and colleagues what I had done. The regulator replied, informing me that I was committing an offence and was liable to prosecution. But I wasn’t. Unbeknown to me, I was actually complying with the legislation by making sure I was acting honestly and openly and informing everyone connected with my professional practice what I had done. I have never stated or implied that I held registration with the HCPC since September 2008. Each time I received a “cease and desist” letter, which claimed I was committing an offence by practising using a “protected title” without registration, there was never mention of an “intent to deceive”. I had no intention of deceiving anyone – quite the opposite – a position the regulator was fully aware of. Yet still the HCPC maintained this deception of its own! They could have advised me that I was able to call myself a podiatrist providing I did not claim or imply that I was registered, but they didn’t. My first face-to-face contact with the Prosecution was at Westminster Magistrates on 22 May 2103 at the initial hearing. No one had contacted me from the HCPC before I received the summons in March that year and thereafter, all contact has been through their solicitors Bircham Dyson Bell (BDB). When I presented the prosecuting barrister with the original patient records and the witness statements from the secretarial staff outside the court before the hearing started, she took them for a short conference with her instructing solicitor from BDB – Richard Langley. When she returned she agreed the evidence was unreliable and could not be used in the prosecution. She then asked what I intended to do. As I thought I had still committed an offence of Misuse of Protected Title – I told her I would plead guilty. But I insisted that all evidence of any dishonesty or deception would have to be removed from the summons. This was agreed – and was subject to a formal notice of agreement, which we subsequently made in June. I then lodged a notice of intention to plead guilty and a sentencing date was arranged later that year. What should have happened on the 22 May, when the Prosecution agreed the evidence of deception was unreliable and removed it from the summons, is they should have abandoned the case. Without evidence of an intention to deceive, there was no offence and the matter should have ended there and then. But if it had, I would have realised that the HCPC had been giving a completely inaccurate position on “protected titles” all along – and that would have been quite embarrassing, given my public stance. But there is more. What I also was unaware of at this point was the legislation does not provide for “protected” titles. The legislation stipulates only “designated” titles. The term “protected titles” was been created by the HCPC during its interpretation of the primary legislation and does not appear in the Health Professions Order 2001 or subsequent amendments. The sentencing hearing in November 2013 revealed the HCPC intentions for the first time. I intended to plead guilty and offer a statement in mitigation as an explanation for my actions and hoped the court would understand that I acted honourably and with the interests of the public at heart in an open, honest and transparent manner. I assumed the prosecution would say something similar – but I was badly mistaken. The Prosecution barrister told the court I had “acted dishonestly and mischievously” for “reasons unknown” and that during the period since I had ceased registration, had signed myself “variously as HPC Registered, Registered and State Registered Podiatrist”. The only evidence of this came from the evidence that was removed during agreement. In doing so, the prosecution deliberately mislead the court citing inadmissible evidence that she knew to be unreliable. My mitigation fell on deaf ears and I was convicted and sentenced to pay a £280 fine plus £5k in costs. I appealed the conviction on the basis that the prosecution had misled the court but as I had already pleaded guilty – the appeal was to vacate my plea. In February 2014, the application to vacate the plea was upheld by HJH Pontius at the Old Bailey who also noted that the HCPC had failed to include the “intent to deceive” element of the offence in the documents submitted to the court that day and it was not read out to me as part of the charge. Judge Pontius also recommended that the Prosecution barrister remove herself from any future proceedings. I was unrepresented until the Old Bailey hearings but have since had legal representation from Nick Glassbrook in St Annes. Nick’s background is in Pharmacy and he specialises in medical and pharmaceutical regulation. His interpretation of the legislation also suggested that it was not an offence to use a title without registration providing there was no deception – and that was part of the argument we used during the Old Bailey hearing – and one which both the Judge and Prosecution agreed. After the conviction was overturned and my plea vacated, Nick wrote to the solicitors for the HCPC asking what their intentions were as it was clear that I had not committed any offence and we proposed the case should be abandoned. Between March and June 2014 he wrote a further 14 times without receiving any response. In April 2014, I submitted an application for registration with the HCPC to demonstrate good intent. It was never acknowledged or responded to. In June 2014 we received notice that another prosecution was being scheduled for September at the City of London Magistrates Court. Same charge as before with the same evidence – including the complaints and altered documents procured by the osteopath. 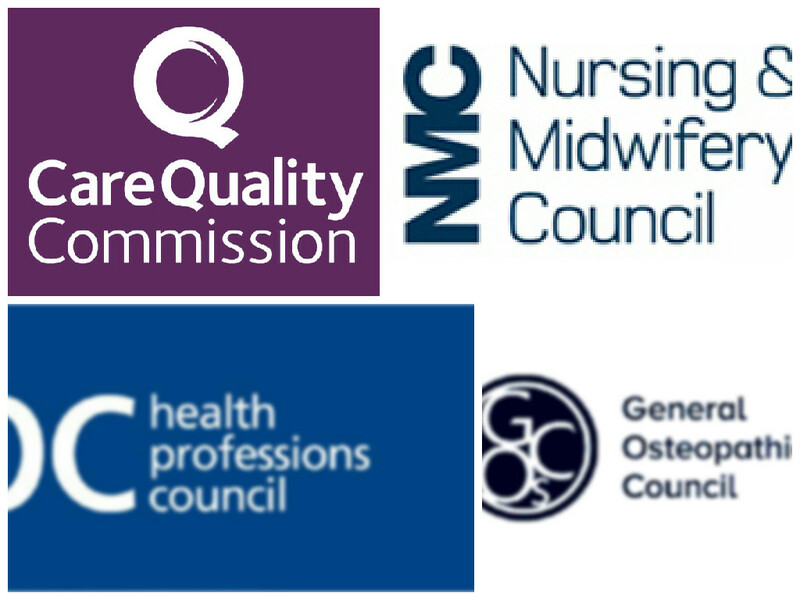 It is important, therefore, for nurses and midwives to distinguish between their qualifications and registration status. Those who allow their registration to lapse can still refer to the fact that they are a qualified nurse, midwife or specialist community public health nurse but must not give the impression that they have a current registration. The hearing in September was scheduled for one day and I entered a not guilty plea. At the start of the case the Judge noted that the statutory provision for evidence for this offence was within a six-month period prior to the serving of the original summons – between September 2013 and March 2014 and most of the hearing was devoted to sorting out the admissible evidence in the prosecution bundle. Judge Ikram also indicated that he would give a written judgement as it was the first case of its kind and that we would have to return to court for that judgement after the trial had ended. The case was adjourned until January this year and resumed at Hammersmith Magistrates Court where I gave evidence in my defence. There was no evidence of an “intent to deceive” as clearly that has never been my intention! Within the six month period imposed by the Judge, there was certainly no evidence of any infringement, so I was curious, to say the least, how the prosecution might portray that there was. During my evidence I was cross-examined by the prosecution – Mr Michael Holland QC. I was asked if the blog was under my control; if I had written the above line and whether I intended to deceive the public when I wrote it. I answered: yes; yes and no. During his summing up, the Prosecutor suggested that even though I had committed no offence in making the above statement – a member of the public who came across this page on the internet, might infer from what I had written that I was in fact a registered Podiatrist and thus a deception could have taken place. I almost laughed out loud when he suggested this – I started my blog as an online record of my case with the HCPC and it contains all my articles and papers on the issue and anyone looking at the website could be under no illusion that I held current registration. Unfortunately, it would appear that the Judge was not so enlightened. When he returned after a short adjournment he announced that he had changed his mind about a written narrative and would instead give a verdict there and then. Incredibly he agreed with the Prosecution that a member of the public might infer that I was registered from what I had written and therefore I was guilty of the offence and fined £200 and £1,000 toward costs. The actual prosecution costs for the day was £27,472 so maybe he thought he was doing me a favour! But it is a perverse judgment for a number of reasons. If the Judge had considered the context of the statement on my blog, he could not possibly conclude anyone might be misled regarding my registration. My blog is not a practice website. I don’t have one. As mentioned previously, it was set up with the sole intention of highlighting my difficulties with the HCPC. I am reasonably well-known in my profession throughout the UK. When it appeared we had reached an impasse with my registration and concerns about regulation, I started the blog to provide the public with as much information as possible about the issue and why I felt compelled to cease registration. That isn’t deception – it is being open and honest. If I had written, “I am Mark Russell, a HCPC Registered Podiatrist” – that would constitute an express deception and is an offence. If I had written, “I am Mark Russell – a Podiatrist” – next to a logo stating “HCPC Registered” – then that is an implied deception and is an offence. Stating I was “a Scottish Podiatrist” in an introductory on a blog about my case with the HCPC could not possibly be construed as an intention to deceive, yet this was the “evidence” I was convicted on. There are no victims – no evidence that anyone was so deceived – the offence is merely a figment of the Prosecutors imagination, yet the Judge agreed! When I returned home after the trial, I looked at the blog and noticed the introductory paragraph is no longer there. I realised when we started the blog in May 2012 I had written the introduction when my web designer was at my home setting the website up for me. It was a light-hearted paragraph, which was only on the blog for a few weeks before I turned it into a correspondence page. When I checked with Google Wayback – which tracks website changes – the paragraph was only online between 21 May 2102 and 3 June 2012. That means, of course, that it actually falls outside the admissible evidence window of six months – and should not have been used. I have been convicted once again of an offence of dishonesty – of an “intention to deceive” – when that is absolutely not the case and I am not prepared to accept that verdict under any circumstances. We lodged a notice of appeal after the hearing and a hearing was scheduled for Preston Crown Court on 21 May 2015. Two weeks before the appeal was due to be heard, the case was adjourned until October 1st as the Prosecuting QC was unavailable, but there has been some significant and deeply troubling developments since then. None of this case has made any sense to me. It seems incredible that this matter has progressed. I would have thought that my initial latter of concern would merit a response from the Registrar – I was highlighting a serious issue after all – and I couldn’t understand his refusal to reply despite several letters and emails. Nor could I understand why the prosecution advanced the case when they accepted and agreed to remove all evidence of deception/dishonesty. Without that crucial element there was no offence, as they must have known. Likewise, I failed to understand why the HCPC would advance the argument that using a title without holding registration was an offence without qualifying the essential stipulation for an intention to deceive. The HCPC has clearly been misrepresenting its regulatory authority to the public and the professions since its inception in 2003 – and continued to do so throughout the preliminary hearings until the admission at the Old Bailey – and this I found incomprehensible. Why would the regulator give a misleading position on the legislative provision? When the HCPC was in the process of being established following enactment of the HPO – the legislation was given to a firm of solicitors to provide a legal framework for its operations. This included an interpretation of what constitutes the various offences and what titles and functions are protected in law. It would appear that the original advice given to the regulator on protected titles and the offence under Article 39 of the Order that I was charged with was wrong. That is the only conclusion one can reach given the admission made at the Old Bailey other than the HCPC has deliberately deceived the public and professions, promoting the position that using a title without registration is an offence under any circumstance, whilst knowing that is not the actual case in law. In April I submitted a FOI request to the HCPC asking who provided the initial legal advice on the HPO legislation and in particular, which solicitors advised on the interpretation of the offences. It is, coincidently, the same firm of solicitors, Bircham Dyson Bell, who are prosecuting me on behalf of the regulator. Given the admissions in Court – and the revised policy statement by the NMC – it seems extraordinary that criminal proceedings were commenced when the Prosecutor was fully aware that there was no evidence to support the charge and yet she deliberately misled myself and the court to the necessary provision of the offence. Why would any prosecuting authority advance criminal proceedings when there was no evidence to support it? That is something I would like an answer to. Running concurrently alongside this prosecution are a number of related matters. The GOsC hearing was initially scheduled for last November but was cancelled a few days before without any reason. In March this year, I was contacted by the GOsC to let me know that they had received a report from their legal assessor that a review of the case concluded a hearing would be unsuccessful as my credibility as a witness was undermined as a result of the criminal proceedings against me by the HCPC. They proposed to table a motion to their Conduct Committee to abandon the case against the osteopath on those grounds. Again, this made little sense. The osteopath admitted procuring and soliciting others to complain but denied knowledge that I had ceased registration. The facts and evidence easily proved otherwise. I pointed out to the GOsC that there would have been no prosecution if their registrant had not acted dishonestly (and criminally) in the first place. I submitted a supplementary statement to them and gave them permission to speak to Nick Glassbrook to get a clear understanding of the case and appeal, which they duly did. The Conduct Committee heard the application to discharge the case on 1st June and upheld the recommendation from the legal assessor that the case be abandoned. I was sent a copy of the Committee’s conclusion and deliberation the following day. Once again I was at a loss to understand how they could reach the conclusion that they did. The connection between the false allegations and the subsequent prosecution by the HCPC were not considered – only the issue of my credibility as a witness and how it was impaired by the current legal proceedings. It did not make sense. But the clue was on the front page of the report… The GOsC had changed their legal assessor. The original legal assessor who concluded there was a case to answer the previous year was a Mr Angus Withington. The legal assessor advising the Committee to abandon during the hearing was Mr Gary Leong. Gary Leong was the legal assessor appointed to conduct a review of the case in February 2015 and it was he who concluded that the case should be dropped. However, Gary Leong holds another appointment. He is also a legal assessor for the Health and Care Professions Council, where he also holds the position as Chair of their Fitness to Practise Panel. BBC Northwest contacted me last month for clarification on nursing regulation following the Stepping Hill and Furnace General cases in the media. The BBC had contacted the NMC and enquired whether the nurses/midwives that had been struck-off were able to continue in practice as unregistered nurses. The NMC stated that they could not. The reporter who was familiar with my case had contacted me to ask for a copy of their revised website statement on use of titles and I was surprised to hear they had changed their position. When I checked with the NMC website, I noted the revised statement had been removed. I duly contacted their registration department – and spoke to the head of regulation – and asked the question myself. I was told the same as the BBC – that anyone struck-off as a nurse could not practice as a nurse again in the UK. When I quoted their policy statement, I was immediately transferred to their media team who initially tried to claim the same position before conceding there was no prohibition on use in the private sector. Nurse and Midwife are not protected titles on their own. Quite why the NMC have sought to conceal the actual position in law is beyond me – especially when they have already publicised a revised policy statement online. But I have asked the question to them. I have yet to receive a response. I am well aware that podiatrists are way down the line when it comes to political and public awareness and it must seem a curiosity why someone from that profession would be prepared to risk their savings and professional reputation over a seemingly minor and restricted matter to that profession. But is not only podiatry – it is all the professions covered by this legislation: physiotherapists, paramedics, social workers, nurses and midwives – to name a few. Many of the nurses who have been struck-off the NMC register are still working as unregistered nurses in private care homes and with employers who do not stipulate registration as part of their employment. As more NHS services are contracted out to the private sector, this problem will continue to develop. We are constantly, as health professionals, encouraged to report dangerous practice that places the public at risk. The recent Francis Inquiry supported that responsibility whilst highlighting the difficulties ‘whistle-blowers’ encounter whilst trying to do just that. Regrettably there is a growing body of evidence that suggests public institutions are conspiring to impede that process – and improperly manipulating judicial proceedings to secure that goal. This entry was posted in HCPC & Regulation by admin. Bookmark the permalink.